In Nursery the children began their learning adventure all about people who help us with trying to help Topsy and Tim solve a problem. They had got so excited learning about Diwali that they lit a diva lamp and accidently caused a fire! The children thought about all of the different people who help us and which people in particular from the emergency services they might need to help them. The children used their imaginations to ring 999 to report their emergency. The children then went into role as firefighters and went to the scene of the fire to extinguish the flames. 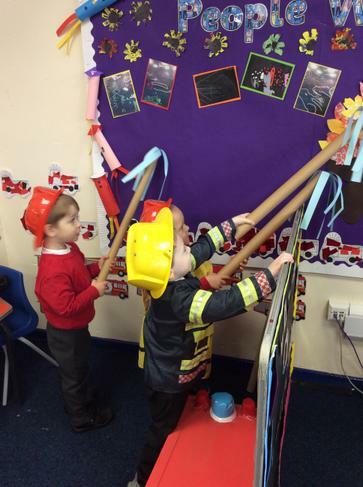 They enjoyed dressing up and using objects from around the classroom as props in their play. Afterwards, the children thought about how our homes can have dangerous items in them. The children identified objects that can be dangerous and should only be operated by adults. 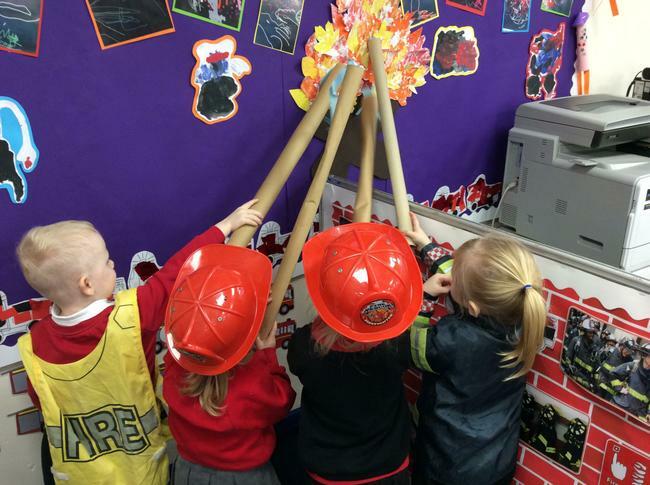 The children then thought about what they would need to do if there was a fire in nursery and practised crawling from the carpet to the fire exit to safety! 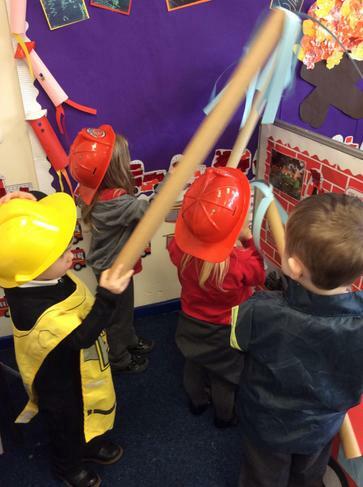 A fire engine then came to school with some fire fighters who were meeting year one and two. The children were very excited to see a fire engine close up, to see the lights flashing and hear the siren sound! We were also sent on a mission to rescue the bears from a fire too! Later, the children learned all about the role of the police and how the police often attend a fire scene. They thought about all of the other things the police force do to keep us safe and the equipment they need to do their jobs. Some children then met a real police officer who showed them all of the uniform and equipment they used to do their job. The children were very excited to try some of the clothing on! Then the children acted out the scenario of a stranger trying to talk to them. They thought about what they might need to do and who might be able to help them. They had some fantastic ideas. Well done Nursery! When the children went outside they came across a road accident! The children had to drive around the obstacles on their trikes by pedalling with their feet and call the police and ambulance services with their mobile phones (the children pretended to do this with the dominoes). 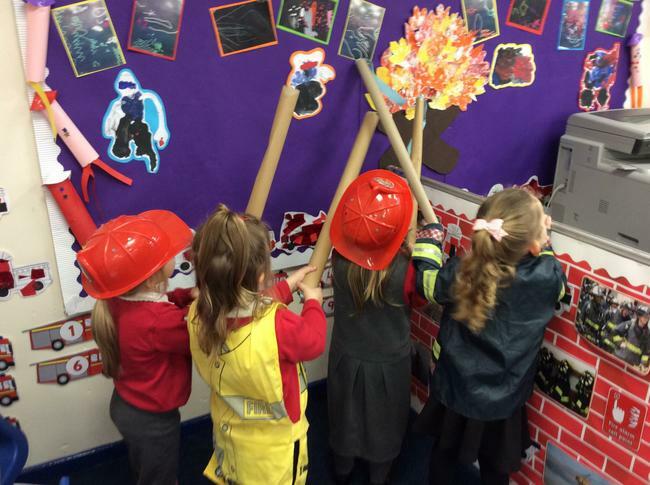 They thought about how paramedics, doctors and nurses help people as well as lollipop people and mechanics. 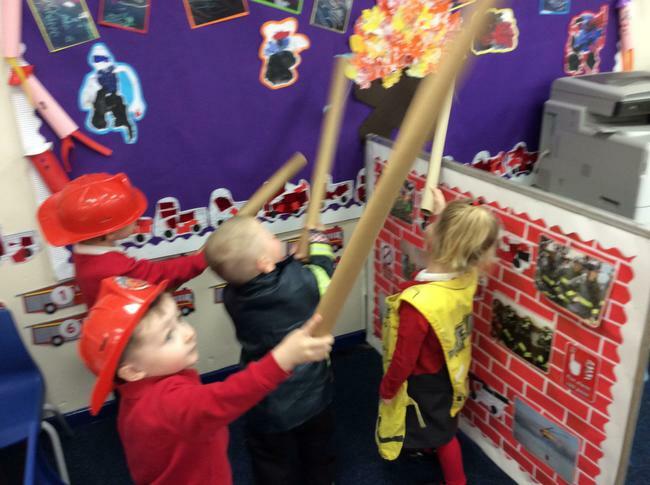 Great work Nursery! In RLS this term we have been looking at People Who Help Us. We have mainly focused on the Police and Firefighters and how they help us and the equipment they use. We have also looked at other people such as Nurses, Doctors, Dentists, Teachers, Mechanics, Vets and Paramedics. 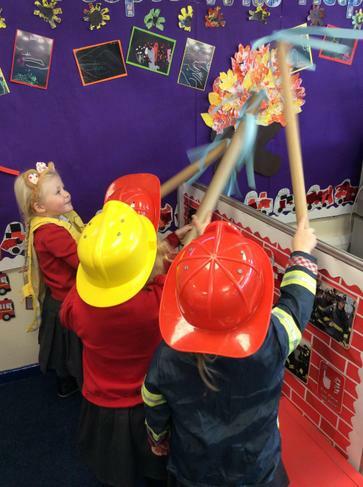 We have been making our own fire engine, saving bears from a fire, had a visit from the Police and talking about the different jobs that we might do when we are older. In RFW this term we have been learning about people who help us. 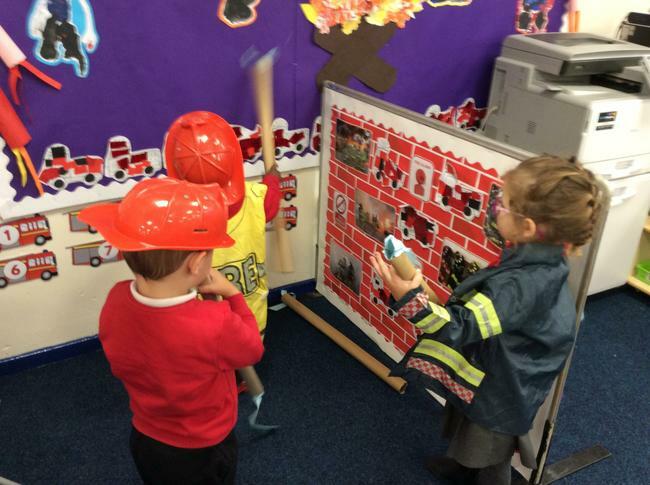 We have looked at the police and firefighters and have done lots of different activities to learn about how they help us. 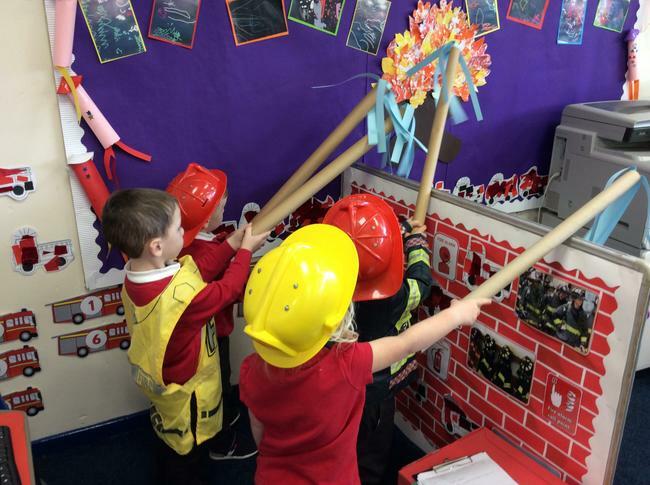 We have written about stranger danger and fire safety, we have made our own fire engine and have saved the compare bears from the fire. RFW were given the Numicon boards and several different pieces of Numicon. We were set the challenge to fill the Numicon board with Numicon. It was very difficult to fit the different pieces of Numicon without any gaps but we worked hard in pairs to do this. We were very proud of ourselves.